The boards produced today are of an exceptionally high quality, with high-strength wood particleboard offering the precision and stability expected of an engineered board and providing an excellent surface for subsequent floor laying operations. The moisture-resistant boards are generally available in 18 or 22mm thicknesses and square-edged or tongue and grooved profiles. The tongue and grooved edges ensure a tight, easily fitting joint with maximum strength and also cut installation time by removing the need for intermediate noggins, as hidden nails or screws can be used. Successful fitting of these boards is crucial. Noisy floors that squeak and creak underfoot have long been a common cause for complaint in new homes. The noise is created by differential movement between the boards, the joists and the metal fixings used to secure them. It may seem counterintuitive, but using fewer mechanical fixings makes for a quieter floor. 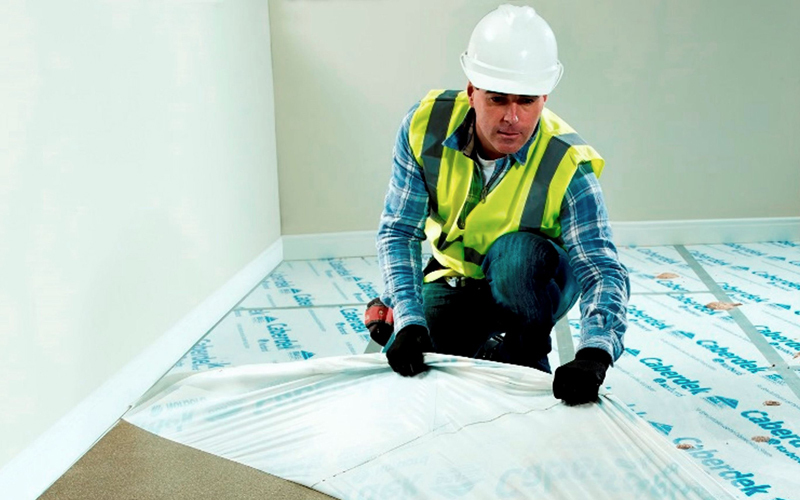 Flooring manufacturers now generally recommend using an adhesive to mitigate the problem of squeaky floors by creating a solid bond between the floor and the joist. Another advantage of using adhesives is that it has the potential to cut the number of mechanical fixings required by 70%, thereby reducing installation time by up to 30 minutes per 50m². Instead of the 17 nails normally required to fix each board to the joist, only five nails are required. This is because the nails have little structural use and are used simply to hold the board in position while the adhesive cures. One of the most groundbreaking advances in particleboard flooring enables it to be used as a safe working platform from early on in the build process. The boards are coated with a durable temporary film designed to protect the surface of the floor from the elements before the roof of the building is on, as well as from plaster and paint spills due to wet trades carrying out work after the floor has been installed according to recommended fitting instructions. 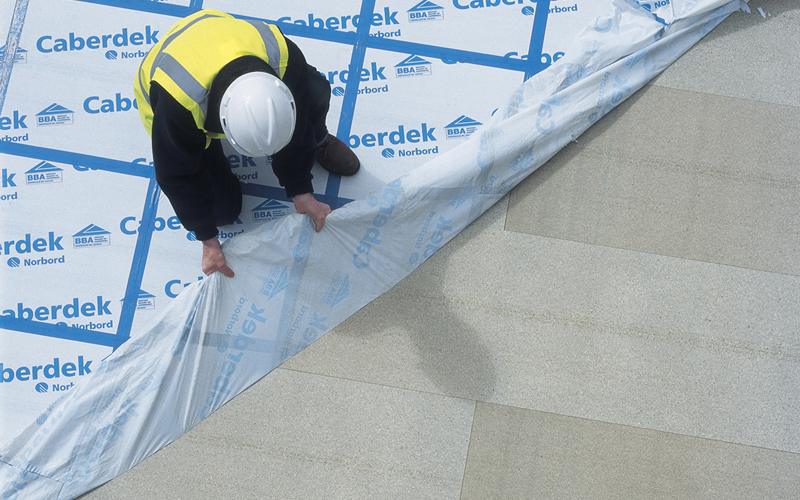 In the case of Norbord’s Caberdek, the product has a heavy-duty, waterproof and slip-resistant peelable film that has high impact, puncture and tear resistance capable of standing up to on-site traffic. Importantly, this coating is designed to resist all weather conditions and ensure the floor remain unblemished for 42 days. The film is secured to the particleboard during the manufacturing process by ‘rollercoating’ which gives consistent adhesion on each board. During the installation process on site, the system utilises a high quality fast setting PVA D3 adhesive which is applied to create a firm bond along the tongue and groove joints between the boards. After the boards are laid, all joints are sealed with a special waterproof tape developed as part of the Caberfix system to prevent moisture and dust penetrating the otherwise vulnerable gaps between the boards. Once all construction and decoration work is complete, and the building is weathertight, the deck is simply cleaned down to remove the worst of the dirt and then the protective film is peeled off the boards taking the tape with it. The floor that is revealed is clean and dry with a sealed wax protective surface that is ready to accept whatever recommended finish is chosen. Equally, this clean and uniform floor surface is acceptable when seen by a developer’s customers before the final finish is applied. Obviously such systems require installation in line with the manufacturer’s instructions but the time saved in cleaning and repairs that would result with an unprotected floor far outweigh the small amount of extra care and effort taken at the installation stage. One further board option is available for situations where a lifetime coating is desired. These tongue and groove particleboards are finished with a tough polyurethane protective non-slip coating permanently bonded to the top surface. As with any product, it is important that a flooring system is capable of delivering on its manufacturer’s promises so BBA certified products are recommended. In addition, the manufacturer should be capable of providing all-embracing solutions that include having support available that can come to site should the need arise.